This page is dedicated to my book about SQL Server programming – released July 2018 on Amazon. You find links to the book at various Amazon sites at the bottom of this page. The paperback version is also for sale via other bookstores. This book explains how to create a SQL Server database, and how to use it from a C#-based application. This is done in a way so that you actually understand what you are doing, instead of just using wizards. The idea is to use as few extra libraries and frameworks as possible – keeping the focus on the database and how to use it. Through the book a common sample is used: a Time-Registration system. This might sound rather mundane, and maybe it is, but the domain is easy to understand and again allows you to focus on the database-programming. Creating a full database application from scratch can be a challenge. You need to understand the basics of database design, as well as the specific Relational Database Management System (RDBMS) and its SQL. You also need to somehow interface to this from your application which, by the way, you also need to design. You can get far with frameworks, but can you go all the way? Do you have a well-performing and maintainable solution? This book aims to guide you through the jungle. 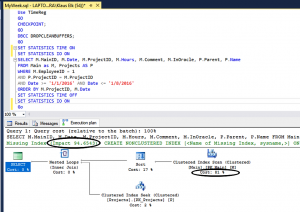 SQL Server is chosen as the main RDBMS, while the database-interface design is demonstrated to work with Oracle as well. The real-life sample application is written in C# using classic Windows Forms. However, the main design and databaseinterface is equally relevant for WPF and ASP.net. 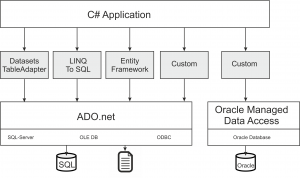 The database framework used is ADO.net. The author works with embedded systems and previously wrote the book “Embedded Software for the IoT”. 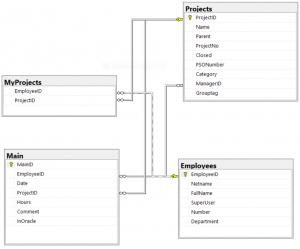 Creating database-based tools, he faced the challenges described, and refined a pattern over time. The paperback is priced at 14.95$ at Amazon while the Kindle e-book is 9.95$. If you buy the paperback first, you can download the Kindle version for free. Please note that the Kindle e-book is created as a “Text-Book” (which makes sense). This keeps all formatting, like tables and figures, but does not give the free flow and choice of e.g. fonts that you get with e-book novels.